The duodenum is the first part of the small bowel, located between the stomach and the remainder of the small intestine. It is directly connected to the stomach. 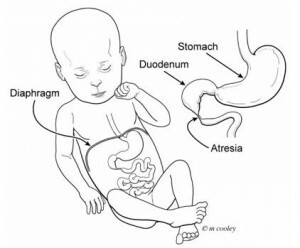 Duodenal atresia is a narrowing or blockage in the duodenum. This blockage prevents the passage of liquids and food from the stomach into the rest of the intestine. The cause of duodenal atresia is not known. It is congenital, meaning it happens before your baby is born. Duodenal atresia develops 1 out of every 6,000 live births. Babies born with duodenal atresia often have other problems at birth, including heart defects. About 30 percent of babies with duodenal atresia have Down Syndrome. • Fetal MRI (magnetic resonance imaging): This type of imaging gives more detailed pictures of your baby’s organs, and can help identify any other problems your baby may have. • Cell-Free Fetal DNA testing: Your doctor can take a sample of your blood to look for copies of fetal (baby) DNA. This is only a screening test. A positive result means that there could be problems with the DNA. This should be confirmed with another test to be sure of the result. Other testing can be done before or after birth depending on your need and the needs of the baby. This test can help identify if your baby has Down Syndrome. • Amniocentesis: A small sample of the amniotic fluid that surrounds the baby in the womb is taken and tested for DNA problems. This test is usually done in the middle of the second trimester. An amniocentesis can be used to confirm findings on the cell-free fetal DNA test. This test can diagnose Down Syndrome. If a test finds you are carrying a baby with suspected duodenal atresia, you will continue to receive care from your obstetrician. Your obstetrician may refer you to the Ohio Fetal Medicine Collaborative (OFMC), which will help you connect with a team of fetal medicine experts. • A tube will be put into your baby’s nose (nasogastric, NG) or mouth (orogastric, OG) down into your baby’s stomach. This tube helps to drain fluid from the stomach, which may build up because of the obstruction in the duodenum. fluids to prevent dehydration and provide nutrition, and, if needed, antibiotics to prevent infection. • Your baby will not be able to drink formula or breast milk until after the intestines have healed from surgery. A special IV called a PICC (peripherally inserted central venous catheter) will be used to give your baby IV nutrition called TPN (total parenteral nutrition). TPN has all of the calories and nourishment needed for your baby to grow. Once the baby is stable he or she will need surgery. It may be a couple of days after birth, or it may be delayed if your baby has other problems that need to be addressed. While surgery is necessary, it is not needed emergently as long as the baby is receiving intravenous fluids and nutrients, and the OG or NG tube is able to keep the stomach emptied. The pediatric surgeon will remove the portion of the duodenum that has the narrowing or blockage and reconnect the healthy ends together. A gastrostomy tube (G-tube) may be placed in the stomach to help provide nutrition. The pediatric surgeon will discuss this with you. After surgery, your baby will continue to receive care in the Children’s Hospital’s NICU. Your baby will need to be on a breathing machine until he or she is fully recovered from surgery. Feedings are started once the intestines are fully healed after surgery. Your baby will be started off with small amounts of breast milk or formula, and the amount will be increased gradually over time. Your baby may be able to take milk by bottle, or may need to have feeds given through an NG or OG feeding tube. When your baby is taking enough breast milk or formula to grow and gain weight, the IV or PICC will be removed. If your baby has been receiving milk through a feeding tube, we will continue to work with you on helping your baby learn to feed, either by bottle or direct breastfeeding. Depending on your baby’s other problems, he or she may need to go home with a feeding tube. • Infection: Your baby may be on antibiotics at birth and for several days after surgery. The surgeon and staff will monitor your baby very closely for any signs of infection. You will be able to take your baby home once he or she is taking enough breast milk or formula to grow and gain weight. The total length of time your baby will stay in the hospital will vary. It will depend on whether your baby is born with other health issues or if there are complications after surgery. The usual length of stay in the hospital is about 3-4 weeks.